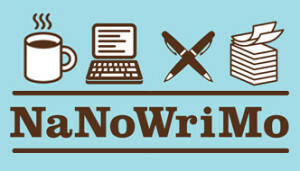 I like to say I unofficially participated in NaNoWriMo years ago one summer before NaNoWriMo existed when I was house-sitting in New Mexico. I challenged myself to write 1,500 words each day for the summer to develop a novel, but I didn’t quite hit my word count. I lacked pep talks, guilt monkeys, wombats, and write-ins. I officially participated in 2010, however, when the inspirational zealot and whirling dervish of novel writing Chris Baty cajoled me into participating. It was really wonderful. I’d become a victim of my writing routine, which had plowed deep ruts into my creativity. I “wrote with abandon” for a month and developed a novel I’d been thinking about for years and took it in many directions, which I’ll call daring, that I wouldn’t have risked otherwise. And then I joined the board of National Novel Writing Month because I thought it was the most powerful creative nonprofit on the planet. And then Chris Baty stepped down from being executive director and gave me a couple of nudges, and I thought, why not, what more could I do with my life than to help spread the glories of creativity. And here I am, in the largest writing event in the world. practically blinded by the creative sparks around me.